This photographic view of the 19' tunnel section of the Hudson River tunnel reminds me a little bit—I mean, it reminds me in a sparkly sense—of the 1815 stage set by Karl Friedrich Schinkel (1781-1841) for Mozart's Magic Flute (from the original gouache, measuring 463 x 616 mm, and part of the collection of the Staatliche Museen, Berlin). Again, its just the initial reaction to the perspective pulled up the Schinkel more than anything else, except maybe for a non-existent underground image from Jan Vredeman de Vries' book on perspective. That said, the set design I'm thinking of features the arrival of the Queen of the Night/Königin der Nacht, so perhaps this association isn't too meshuga...excepting the ripped-to-shreds lust for revenge that the Queen of the Night sings about, which hasn't much to do with digging a tunnel. (And just in case you've never seen Amadeus by Milos Forman, you should, if for nothing more than watching M conduct the Queen of the Night aria.) Also, I'm writing this note at the tail end of the day of Beethoven's 248nd birthday, and Mozart (although he would conduct the premier of the opera) wouldn't live out the year of his opera. I don't know what that has to do with anything, though it almost does. This was “holing”, as in working in a hole, and served to illustrate a point in Mr. M.G. Johnson’s paper “The Working of Steep Seams”, which I think appeared in a West Australian mining journal around 1900. 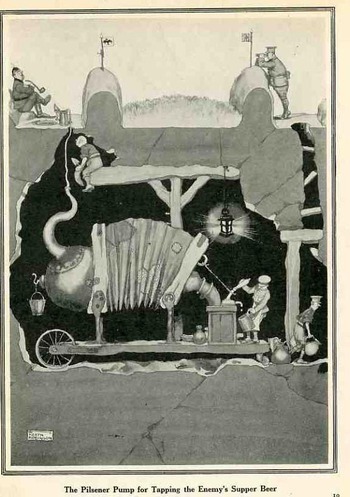 It seems that the miner in the picture would spend his day chunking coal from a hard vein, laying down, scrapping (I think) away at the coal in a too-tight tunnel. Did he do this for hours? Days? Weeks? I guess the bad answer is that he did this as long as the coal could be followed, though I suspect that the miners must've traded out positions to prevent any one man from doing this sort of extremely difficult work for too long, sharing the responsibility of The Bad Job. 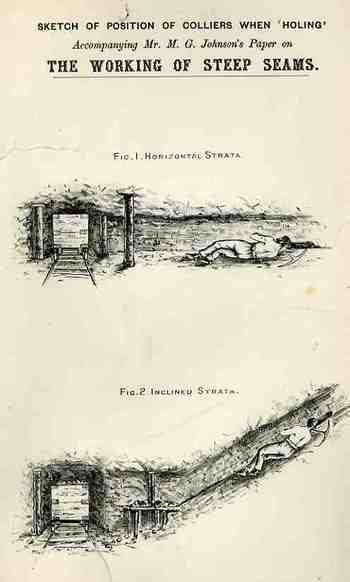 (Also, it looks as though that the major tunnel in which the coal car is located may be 4 or 5 shoulders high—certainly not tall enough to walk in, which means that this guy could’ve crab-walked to this position for a half mile or more, just to get to work. The tenacity of this worker to do his work and collect his pay to feed his family was just incredible. The first image really doesn't need much commentary, though calling the worker a "tugger boy" pulling up a "hudge" was probably a bit of sardonic camaraderie--except that the doing of the job would distance you from its folksy name. "Tugger boy (Brist). One who draws small tubs or sleds underground by means of a tugger. Called Tugger-work. (Gresley), 1883. The depiction of what seems to be a mature man in the image might be a piece of propaganda. In any event, the Tugger Boy carries his own flame on the top of his headgear, and the chain that attaches him to the heavy coal bucket runs from his waste down the front of his body and through his legs. 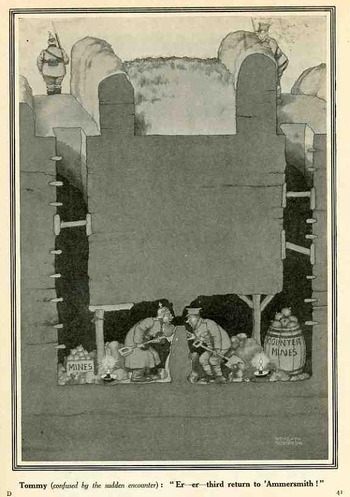 The next series of images come from the pen of W. Heath Robinson (1872-1944) who was a lovely, quirky, charming, skewed, dark, stiff-bouncing and creative illustrator capable of considerable whimsy (light and complex) and deep skepticism. The images I’ve selected are from one of his three WWI books, Hunlikely, published in 1916 (Some "Frightful" War Pictures (1915), and Flypapers (1919), were the other two) and depict scenes from the intra-trench tunnel wars, which were battles fought in the midst (or, actually, beneath) other battles. This was a savage, grueling, post-adjectival affair—exceedingly dangerous, difficult, awful. And it happened a lot during the war, given the experience of stalemates between vast armies sunk into mole city trenches, with no one going anywhere for long periods because there was nothing in between the two impervious lines but a death vacuum. So one of the solutions was to try and tunnel underneath the opposing army’s defenses, fill the far end with high explosives, and blow them up. The other side was doing it too, and in the middle of it all was the incorporation of newer/better listening devices to detect forces rummaging around underneath your position dozens of feet into the ground. It was a bad business. (One of the other means of breaching the trench lines was aerial combat, but bombers carrying tons of HE were still yet to be invented; poison gas was another. Most of the time the armies would just meet in the middle in wide plains of nothingness in a sea of hot, expanding metal, where to this day in many of those places nothing can live). 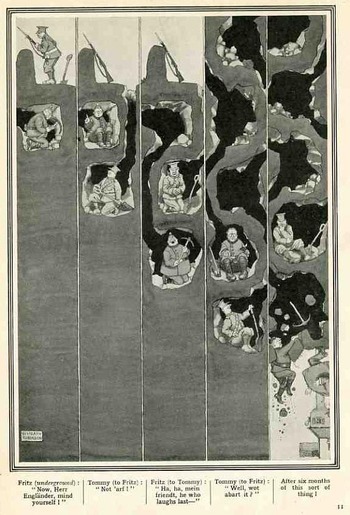 This is a small 1.5" ad that appeared in a premier issue of Scientific American, June 11, 1909. It is tiny and attractive, a sunburst design for a Sun typewriter, the text claiming that it wasn't sold door-to-door but via paper advertising to save costs in production and delivery, offering it for what was then a discounted price of $40. That 40 bucks is equal to about $1000 now according to the inflation calculator at the Bureau of Labor Statistics site--better though perhaps to think of it in terms of monthly/yearly income: laborers earned about $300-$600 a year in 1910, whereas an engineer or accountant would make between $2000 and $5000 a year; that would make the machine somewhat expensive at about a week's salary or less, but affordable. The address says to apply at 317 Broadway--the building is still there and a fine structure it is; presently the address is broken up on the ground floor and shared by a booze shop and pizza place, sandwiched by a 7-Eleven and a McDonald.